For Eliamaria Crawford, time spent in Professor Allan Saxe's political science class is literally paying off. The professional illustrator has penned Humans Really Irritate Me, a book of comic illustrations starring the professor. It all began with an introductory political science course she took during a summer semester. "As soon as he opened his mouth and said his first silly quote, I just had to write them all down," Crawford says. "By the end of each semester of class, I had more quotes than notes." Crawford began the illustrations for her webcomic, "Elia in a Box" and they eventually found a home in The Shorthorn, where she landed a job as a cartoonist her senior year. The newspaper featured a one-panel Saxe comic in every issue. By the time Crawford graduated in 2014 with a BFA in theatre arts, she realized she had a plethora of Dr. Saxe quotes that still weren't drawn. She picked her old notebook back up and decided to get them published. Saxe has taught political science at UTA since 1965 and is one of the most recognized personalities on campus. He has mentored thousands of students, some of whom still sit on his classroom floor or just outside in order to hear his lectures. He gives Crawford's efforts a thumbs-up. "Frankly I enjoyed it because someone finally captured who I am," Saxe says. "There is a certain mindset for sarcasm, and she has it." 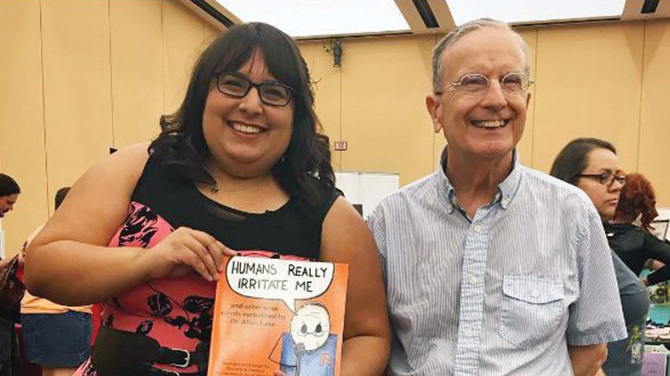 Published by Dusk Comics, Humans Really Irritate Me: and other wise words verbalized by Dr. Allan Saxe can be found on Amazon and at Barnes & Noble for $10.99.